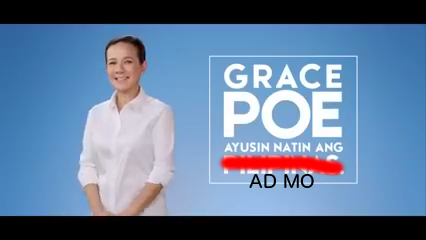 So goes the latest ad of Grace Poe, who is gunning for the post of the president of the Republic. This is just a short note to highlight some things. So, she’s like, a prophet now? Kudos to her PR team, such timing is impeccable. Yet we have to ask: after all those hearings, has Senator Poe produced any report, any findings, any concrete solutions at all? When all she could crow about are elevators, escalators, and bathrooms – Houston, we have a problem. The problems with the MRT3 are more than just elevators and escalators and bathrooms and, yes, even trains: the problems with the MRT3 have been there since 2007! I had blogged several times about the problems with the MRT through the years, see MRT: Seconds from disaster, Another look at the MRT, MRT: Seconds from disaster 2, Technology and the MRT, and What should be done with the MRT? Yes, the real problem that we all can see is that the MRT3 is operating way beyond capacity, brought about by wrong design assumptions, and Joseph Estrada’s populist idea of lowering the fare, thus making more people take the trains, way more than what was the designed capacity. And if you operate beyond capacity, the trains suffer, they carry more than what they were designed to do, so they conk out later on, rails break because the trains passing through are heavier than expected. That’s where we are now. We’ll talk about trains in a bit. Two, it is not honest at all. Infrastructure projects take time. They are not straight-from-the-shelf things that you can take out, put somewhere, and voila! What the ad won’t tell you is that projects that are designed precisely to alleviate problems that her ad has stated are already either underway or to be started. The Skyway Stage 3 connecting SLEX to NLEX is being built, so trucks from Batangas ports and Laguna industrial parks no longer have to take EDSA, C-5, and South Superhighway to deliver goods to the north. Another component, once started, will go directly towards the North Harbor. LRT1 is to be extended up to Bacoor in Cavite, and new trains will be procured from Japanese companies (because the new train acquisition is to be funded through Japan overseas development assistance or ODA loans, only Japanese companies can bid). LRT2 is being extended up to Masinag so that people of Antipolo have another alternative mode of transportation. LRT7 is just waiting for some financing closing before they begin construction. And the much maligned MRT3 will get new trains (to be honest, not enough but will alleviate current overloaded situation). Yes, we need more trains. But why only now? From the first time I blogged about it to now, it is a seven year span. Why did it take so long? While this was discussed in the Senate hearings, no emphasis was given on the complicated build-lease-transfer agreement between the owners of the MRT3 and the Philippine government. Yes, we don’t “own” the MRT3 – we are leasing it from the private owners, we pay them GUARANTEED payments regardless if the MRT3 earns or not (hence the yearly government subsidies running into tens of billions of pesos), and government maintains the system at government’s expense. So, where do trains come in the picture? The private owners are the ones who are supposed to provide new trains! What happened? They didn’t. They only expressed their willingness to do so when Poe had her first hearing. There was even a legal issue if the government can buy new trains, all because the government doesn’t own the MRT3. The government decided to get new trains, and we can expect new ones next year. That’s just 2 major projects. They will take time, they are not instant-noodle solutions. They take time because the government wants to do it right: projects untainted with corruption; projects that are not ad hoc, not piecemeal, but part of a holistic solution. Projects that are carefully planned. Don’t we want that? The next administration will have to make sure these are continued, especially projects that are in the pipeline. But if we elect someone who is averse or will tend to scrap everything, we are not back to zero, we are back to the Stone Age. Aside: Mar Roxas intends to reform our bus system so that drivers are paid per day and make routes more profitable. I hope he’d take on the taxi system as well, since it is similar to how buses are operated. Another aside: for this local problem, only one candidate has proposed solutions – only Roxas. Others we got I-promise-you statements. Survey results are here (PDF). It’s all for votes, obviously, but kind of pandering as well. Parang bahala na kayo, people outside of Metro Manila. I have been a resident of Metro Manila my entire life; I’ve been taking the MRT for more than 8 years now; I’d seen how horrible the traffic was when Skyway phase 1 was started and the Libis Flyover-Katipunan Underpass was started. I’ve been through that hell that everyone is raging about. I want solutions that are sound, better planned, and untainted with corruption. I look forward to a time when government plans can be executed without ten million cases and more controversies. We keep on hearing complaints about Imperial Manila and yet we have a candidate who props it more! Enough of that! Now we have five years where everyone is getting their fair share of resources. I have to wait for more than 10 years for a better MRT. In so many places they have had to wait 30 to 50 years for a bridge and a road and improvement. They got it now. That’s fair to me. And thats what we should expect from a good government that does not pander for votes: a country that grows together and not have one part spoiled in an irresponsible way. That’s the real cause of the hell that is being fixed. And we won’t get that, apparently, from Grace Poe. To reiterate: the ad was made to make her appear prophetic and to raise antagonism against the Aquino administration; to allege, through omission of facts, that nothing’s being done about infrastructure problems; and to pander more to her core constituency – the angry netizens of Metro Manila, disregarding the rest of the country. This entry was posted in Ink, Politics. Bookmark the permalink.